Ferry Dock Marina is a full-service marina located on Lake Champlain offering non-ethanol gas, diesel, pump-outs, and seasonal/transient/hourly dockage. 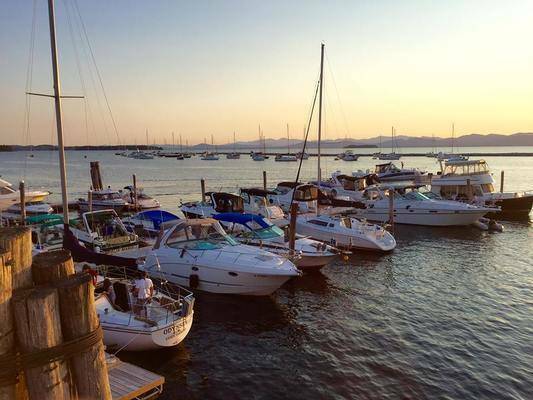 We are located right in downtown Burlington, Vermont, within walking distance to the Burlington waterfront, restaurants, hotels, and the Church Street Marketplace. The marina is located right in front of the restaurant Spot on the Dock. Serving breakfast, lunch, dinner and tropical cocktails from one of the best locations on the waterfront to see the sunset. Killer food, friendly service, and good vibes. Accessible by boat. Boaters will be charged for a minimum LOA of 24'. **Please note that for the night of July 3rd, all boaters will be charged a flat rate fee of $185 for that night.